War! Huh! Yeah! What is it good for? Dinos eating Nazis! Say it again y'all! DC is continuing its month long project of printing single revival issues of its classic war comics. This week's release is a "Weird War Tales" one shot with three stories. Although brief, they each have a Twilight Zone-like quality to them, and I mean that in the best possible way. Each tells and clever story, at times moving, at times unsettling, at times comical. And while they differ in tone and art style, the underlying message of each story comes down in support of the classic Edwin Starr protest song I paraphrased to open the review. I was surprised to see such a strong anti-war message coming through so uniformly from the book's three creative teams, to the point where I wouldn't be surprised if vocal supporters of the military came out to criticize the book. But for me it was an entirely enjoyable read that I'd recommend not missing out on.The first story of the collection is "Armistice Night" by Darwyn Cooke and Dave Stewart, and it was easily my favorite of the three. That's not to say the others were poor, but Cooke and Stewart's dark comedy of an afterlife of red landscapes dotted with barren trees where the deceased who glorified war celebrate by drinking and fighting was simply more fun to read than the two more serious works. And yet it still managed to clearly convey a message that the idea of celebrating war is a ridiculous thing. And that people who celebrate combat, as opposed to people who celebrate achieving a goal that it became necessary to go to war to reach, are not the best sort to be worshiped as heroes. 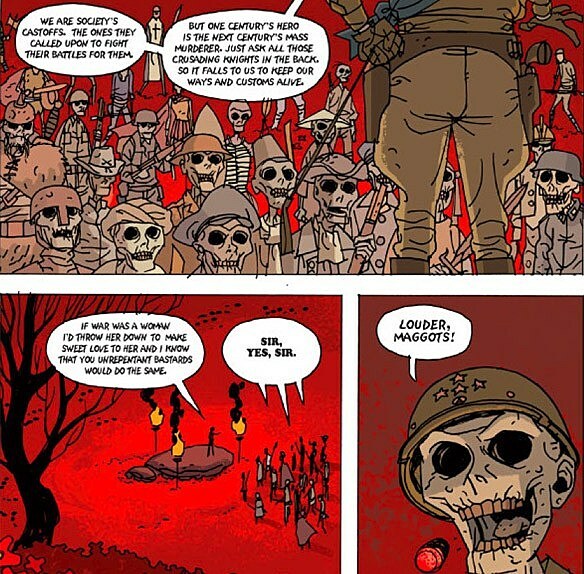 The celebrations of the dead, each man (or woman) decked out in the uniform they wore in life whether they were a Roman centurion, a crusader, or a soldier in World War II, are beautifully rendered by Cooke and Stewart in a way that's both comical and haunting. The other included tales, "The Hell Above Us," written by Ivan Brandon with art by Nic Klein and "Private Parker Sees Thunder Lizards," written by Jan Strnad with art by Gabriel Hardman and colors by Daniel Vozzo, both fit the vein of the classic creepy supernatural war story a little closer. Brandon and Klein's story of the fate of the sole survivor of a submarine sunk at Pearl Harbor effectively conveys the startling impact of the man's bizarre fate. Strnad, Hardman and Vozzo manage to pull off the impressive trick of telling a story that contains a Tyrannosaurus Rex fighting a Nazi infantry squad that still manages to be a sad reflection on the tragedies of war. I found in a little depressing, honestly, but not so much that it brought down my enjoyment of the book. It's hard to be that down a few pages after seeing a triceratops knock over a German tank. The "Weird War Tales" one-shot brought together a great group of writers and artists and turned out three stories that, although only seven pages each, carry on a great tradition of thought-provoking short supernatural fiction. If you're a fan of the genre you really need to make sure to check this one out.